A writing weekend for experienced women (and nonbinary) writers of fiction, nonfiction, poetry and all in-between genres, designed to help you bring what you are writing into alignment with what wants to be written, for the sake of all creation. In a quiet natural setting by a pristine lake, we open ourselves to whatever wants to speak through us, in conscious alliance with both nonhuman and human intelligences. As our deepest knowing often shows up in our dreams, we begin each day with dreamwork. The Lac Cafe retreat is a rare opportunity to write in community with brilliant women in a remote setting on the edge of wilderness. Lise has a talent for shepherding what “wants to be written” with gentle, incisive prompts and activities, while sumptuous vegetarian fare nourishes the body. Swim in a pristine lake, gather by the fire, and explore the forested banks of a colorful bog in the late summer sun as your stories rise out of you and cover the page. I call Lise “poet whisperer”—though there are no prescribed genres for writers at Lac Café retreats. Lise does so much to hold space for writers to do the work that needs to be done. There's a fierce female energy that lives in the trees at Lac Café that helps us become more grounded in the writing, in ourselves, and in nature. For these very reasons and for the friendships I've made, the experience Lise consistently offers is a huge gift. And the food amazing! I have been coming to Lac Café for twelve years. Fresh warm farm eggs for breakfast, beginning the day with breathing, an abundance of air under a canopy of trees and a cerulean sky, listening to our hearts beat and our breath reach heavenward. Women of different backgrounds, all eager to get pen to paper, all searchers. Come and write the stories that need to be told, pass them from one to another in beautiful words read by the fire in the night, so that even the hardships are made bearable. Lise's retreat changed the course of my life! I went with a writer's block that had gone on for years and left not only writing (and continuing to write) but deeply connected to the places and processes where my writing comes from. Lise's facilitation – a mixture of ferocious love, unconditional positive regard, sincere interest in the writer, and an elegant lack of pretension – is the exact recipe to unlock not only the writers in each individual, but the writing body of the group, the deep ecological mycelium mind from which the language of the earth seeks to speak. Hers is a work of reconnection - of bodies with language, of bodies with earth, and of bodies with other bodies in deep reciprocity and communion. I am so grateful for this opportunity. Three years ago I showed up at Lise’s retreat depressed, riddled by self-doubt, and not sure why I’d journeyed so far from my home in Los Angeles to hang out in the woods with strangers. I am a professional writer and wondered why I’d go on a retreat where I wouldn’t get feedback about a work in progress. But after two days of reading poetry, sharing my responses, sitting by a fire, swimming in a lake, and being supported by wonderful women, I left not only rejuvenated, but inspired to return to my writing with fresh eyes and renewed confidence. This one weekend changed the trajectory of my life forever. I created my own business, inspired by Lise’s retreat. I now run workshops and work as a memoir book coach, tending to the hearts and minds of women daily. I never could never have done this without Lise's influence. Lac Cafe is my annual re-set button. Under Lise’s expert guidance, and in the company of the women she brings together, I write my heart out. I relish that this isn’t a retreat where my writing will be critiqued. Lac Cafe is an opportunity to love writing for writing’s sake, to experience how writing can nourish you, whether you never do it or do it daily. I recommend this retreat to anyone who wants to celebrate writing and female community, to anyone who was like me three years ago, desperate to connect, starving for the power of female energy. I promise you will walk away grateful you came and determined to never miss a year. There's so much to say and hold close to heart and spirit after a walk through the bog, to draw back to mind after swimming into the calm waters of the lake or sitting by a wood fire while a barn owl swoops by—and all that is before the breathing exercises, the food and flowers, the sharing of mushrooms and music and mugwort! Two years of such an entrance to harvest works the same wonders for a human being as finding nuts must do for squirrels and spyhopping off fallen logs on ladies writing in the woods quietly and with great devotion must do for chipmunks. It shores me up and polishes my resolve to make poetry. Lac Café has been an incredibly enriching space to dive into my creative work. 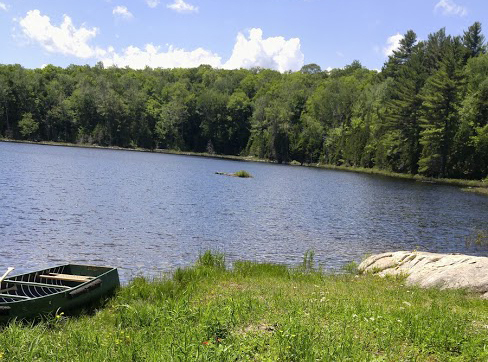 Nestled in the woods outside Montreal, on a private lake, the natural surroundings offer a quiet space for introspection, writing, and connecting with community. There is a beautiful balance of solo writing time, group time, meditation, and delicious meals and laughter. Lise offers powerful, engaged, and steady facilitation throughout the weekend which helps me to go into the shadows. I love going to Lac Café. It's unlike any other place and I always leave with writing that I needed to write.